The A/V receiver is the brains of your home theater system which means it’s the most complicated piece of the puzzle. This article will guide you on how to use your receiver to set up your speakers for optimal performance. Once you dive into the world of receiver set up, you’ll find that it’s actually fairly intuitive and not necessarily as difficult to get excellent results as you may have thought. Keep in mind that for many receiver settings there are different schools of thought and opinions, but these are our suggestions based on the thousands of hours we’ve spent helping Aperion customers as well as setting up our own systems. This article will be based on the set up menus of the Marantz SR8012 that we use in our sound room here at Aperion HQ. While your own menus may be slightly different, most modern A/V receivers (AVRs) will have fairly similar menu layouts. To start off, press the “Menu” button on your AVR remote. Many remotes will require you to ensure you are controlling the correct device by hitting a button labeled “AVR” or “Amp” first. Once you do this, the graphic user interface (GUI) of your AVR should pop up and look something like the top level menu shown at the left. For the purposes of this article, we are going to focus on the speaker section and the settings that go along with it. Use your remote to select the “Speaker” submenu and the first choice will be whether you want to do an auto or manual set up. There are several different auto set up programs, with Audyssey being the most well known. The auto set up programs are a great way to put the computing power of your receiver to work for you by having it adjust all the settings automatically. It does this by utilizing an included microphone to take room measurements and then adjust the receiver’s parameters accordingly. In order for the auto set up to work ideally, you need to use a tripod to stabilize the microphone and then position it in multiple spots to accurately capture the properties of the room. Also, the different brands of auto set up programs have varying levels of success in dialing in your system. Even if you do use your receiver’s auto set up program, we recommend taking a look at the settings it applied and giving yourself the option of tweaking them for your preference. So having said all that, if you want to get your hands dirty and do it the “old fashioned” way, go ahead and select “Manual” and let’s have some fun! Let’s go through each section and get into what each does as well as some setting recommendations. This section is pretty straight forward, here you’ll let your receiver know what type of system you have (5.1, 7.2, 9.1 with Dolby Atmos, etc.) and also whether or not you’ll be bi-amping your speakers and setting up any additional zones. If you are bi-amping, make sure you set the rear surround channels to “bi-amp”. This will send front channel signals through the rear outputs. Similarly, if you will be using your rear channels for Zone 2 you can use that setting here. You can also set up Zone 3 in this menu, although typically you will need another amp to power a third zone, so you’ll just be sending a line out signal from Zone 3 pre-outs. Pro Tip: If you happen to have a 3.1 system and that isn’t one of the choices, make sure you set the surround channels to “None”. This will route the surround channels to your front and center speakers. In this section you’ll specify the size of your speakers and also if you have a subwoofer, as well as if you have multiple subs. How do you know whether your speakers are “small” or “large” you ask? Good question! Essentially, it’s a matter of whether you want to apply a crossover to your speakers by setting them to “small” or if you want to send a full range signal, usually down to 20 Hz, to them by setting them to “large”. You do not have a subwoofer. If you don’t have a subwoofer and your front speakers can at least play down to 40-60 Hz at a reasonable level, then a setting of large would make sense. Just make sure you still set your center and surrounds to small. If you front speakers’ frequency response only goes down to 80 Hz then you would still want to stick with small and should probably consider getting a sub. Your front speakers have built in subwoofers. Some front speakers are of a hybrid type design with passive midrange drivers and tweeters combined in the same cabinet with powered subs. If that’s true for your front speakers, you’ll definitely want to set them to large to get the most out of them. Again, you’d still want to go with small for your center and surround speakers. Your subwoofer is underpowered for your space. If you subwoofer can’t effectively fill your room with bass and your front speakers can help out by playing well below 80 Hz, this would be another scenario where a setting of large might be better. Pro Tip: Beside the above situations, in just about every other case we recommend a setting of small for all of your speakers and then using the crossover settings in the crossover submenu. This one is easy, it’s merely the distance of your speakers from your main listening position. The receiver will use the distances to set delays in order to make sure the sound waves being produced by your different speakers reaches your ear at the same relative times. Pro Tip: The distances that are set by the auto set up program in your receiver are almost always spot on. Even if you plan on doing a manual set up, you can save some time by running the auto set up and then leaving the distances that it calculated when you go to do a manual set up. This is the relative volumes of all the different speakers in your set up. Before you go to this section of the set up menu, beware! Loud test tones will begin to play from the first speaker, so be sure any unsuspecting pets, babies, or otherwise aurally sensitive individuals have been removed or prepared. Calibrating the channel levels of your receiver is important to make sure you hear your content as it was intended to be heard and that none of your speakers overwhelm the others or are drowned out. The best way to use the test tones to calibrate is to use an sound pressure level (SPL) meter. Most SPL meters will have three main settings: range, weighting and response. 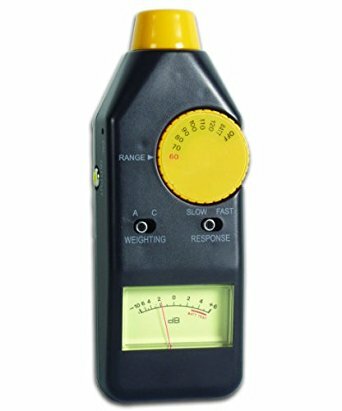 The range is what volume you are calibrating to, we recommend setting this to 70 dB. When you do this, when the needle pegs to zero, it is reading a 70 dB tone. The weighting refers to EQ curves, “A” weighting will EQ out bass frequencies while “C” weighting measures a flatter frequency spectrum and “Z” weighting is completely flat. If your meter has Z weighting available use that, if not use C weighting. Slow vs. fast response is merely the speed of the needle in the meter. Set this to slow to keep the needle from bouncing around erratically. Now that you have the meter set up properly. Position yourself in your most common seating position in the room. You’ll be calibrating to a single point in the room, so just make sure this is where you usually sit! Aim the meter straight up and begin playing the test tones from your speakers. For each speaker, adjust the channel level in the GUI until the meter reads zero. Once you have done this for all your speakers, they will all be playing at the same relative volume at your sitting position in the room. Pro Tip: The SPL meter is not especially accurate for the subwoofer, so you can dial this in by ear. Use some music with a good amount of bass and adjust the subwoofer’s own volume knob until it sounds like a smooth extenstion of your other speakers. If you took our advice and set your speakers to small back in the Speaker Config. menu, here is where you’ll specify the crossover for each speaker. What’s a crossover? A crossover specifies what frequencies a speaker will play, it’s essentially a filter that only sends certain frequencies to the speaker in question. The term comes from the components inside a speaker that determine which driver handles which frequencies. 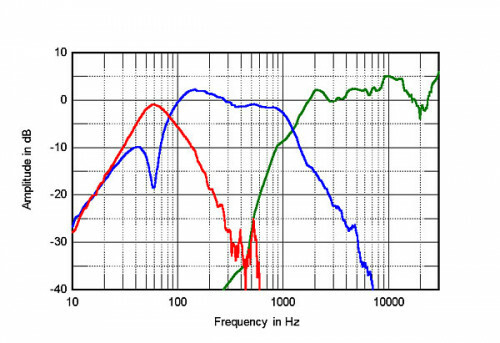 If you look at the graph of a speaker, like the one at the left, you’ll see that the driver’s frequency responses (each colored differently) have a crossover point, where the frequencies from one driver fall off while another driver’s response picks up. This “hand off” between the drivers creates an “X” like pattern and the “crossover point” is the point at the center of the X. In this section of your receiver you’ll set which frequencies will be sent to your speakers. One thing about crossovers, for all of your speakers except for the subwoofer, they will play above the frequency you set and not below. However for the subwoofer, it will only play below the crossover setting. A good general setting is to just set the crossover for every speaker in your system to 80 Hz. When you do this, your fronts, center and surrounds will all play from 80 Hz and up and the subwoofer will handle everything below 80 Hz. Setting all of your speakers to the same crossover point is a good idea because it ensures you get a smooth transition from where your speakers leave off and the subwoofer picks up. 80 Hz is a common starting point because most speakers are capable of playing down to 80 Hz with authority. Also, you don’t usually want to set your subwoofer any higher than 100 Hz because at these frequencies the sound becomes “localizable”, that is, you can tell from which direction the sound is originating. By keeping your subwoofer crossover at 80 Hz, you are ensuring that you hear the bass throughout the whole room and not coming from just the sub itself. Now the 80 Hz setting all around is just a guideline and there are times when other crossovers will be advantageous. For instance, if you have smaller speakers that don’t really play below 100 Hz, you may want to bump their crossovers up to 100 Hz to make sure they aren’t straining to hit frequencies below their range, which can thin out their sound. Alternately, if you have big tower speakers for fronts, you may want to get a little more bass than just down to 80 Hz out of them. For instance our Verus II Grand Towers are capable of playing down to 35 Hz at a reasonable volume. So you could set the crossover to 40 Hz if you wanted. But there are a couple caveats. First, if you have a sub, you’ll be doubling up on the frequencies between 40 and 80 Hz, effectively boosting those frequencies and favoring them over the other frequencies from your source. Second, 40 Hz is near the bottom of the VGTs range, so you are compromising its midrange performance to some degree by having it play that low. For both those reasons, if you do want to get a little more bass out of your VGTs, we recommend a crossover of 60 Hz. Even so, there isn’t any one right answer here. If it sounds better to you to set your fronts to a crossover of 40 Hz or even to go for a full range signal by setting your fronts to large, then go for it. Everyone’s room, and preferences, are different. This section is fairly basic, usually it’s one main setting which is to specify how you want the bass managed in your receiver. It’s a crucial section though because if you do set your fronts to large, you’ll need to enable a setting called “LFE + Main”, sometimes also called just “Plus” or “Both” or “DoubleBass” in order to get your subwoofer to produce sound along with your fronts that are also playing the low frequencies. If your subwoofer is not playing at all, go straight to this menu as your first troubleshooting effort and make sure that “LFE + Main” or other setting is turned on. Sometimes the subwoofer crossover will be located in this menu and is labeled “LPF of LFE”, which means low pass filter of low frequency effect. As noted, the subwoofer will play all frequencies below the setting you enable here. Pro Tip: If you set the crossover for your subwoofer in the receiver, just turn the crossover that is located on the sub itself all the way up. This will defeat the subwoofer crossover and allow the receiver’s setting to apply. And look at that, we’re done, that was a piece of cake, right? We hope this guide has been helpful and you learned a few tricks along the way. If all else fails, just do some experimenting with trial and error. Trust your ears, have fun and as always, happy listening!